Tobacco contains between 2000 and 4000 substances; many are injurious and at least 60 are carcinogens e.g. tar, nicotine, phenol, benzopyrene, formaldehyde, nitrosamine, nitrogen oxides, carbon monoxide, cadmium. Tobacco smoke contains plenty of free radicals (reactive oxygen species) which inactivate native anti-proteases, activate neutrophils and incite tissue damage, thereby producing emphysema. Smoking also promotes other inflammatory diseases such as atherosclerosis. 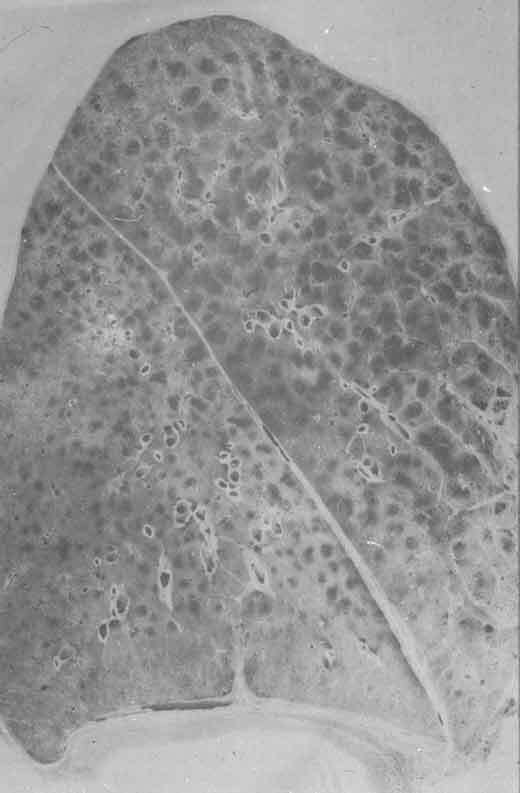 Thin section of whole left lung showing gross changes of emphysema viz. overexpanded airspaces (dark pockets), most prominent in the uper lobe. Thromboangiitis obliterans (TAO) is a vascular disease that occurs almost exclusively in young (< 35 years old), heavy smokers. It was first accurately described in a group of Jewish patients in 1908 by New York surgeon and pathologist Leo Buerger. It appears to be caused by a hypersensitivity to some component of tobacco. It is a distinctive segmental vasculitis of medium and small arteries, principally the tibial and radial arteries. Microscopically there is inflammatory thrombus occluding sharply defined segments of artery, often with microabscess formation. The inflammatory process extends to veins and nerves adjacent to the affected artery. With chronicity, artery, vein and nerve become fibrosed. Early signs are Raynaud's phenomenon, superficial thrombophlebitis and severe foot pain. This is followed by ulceration of the toes or fingers, which can become gangrenous, leading to amputation(s). There is no effective treatment, but complete abstinence from tobacco early in the course of the disease may ameliorate its course. 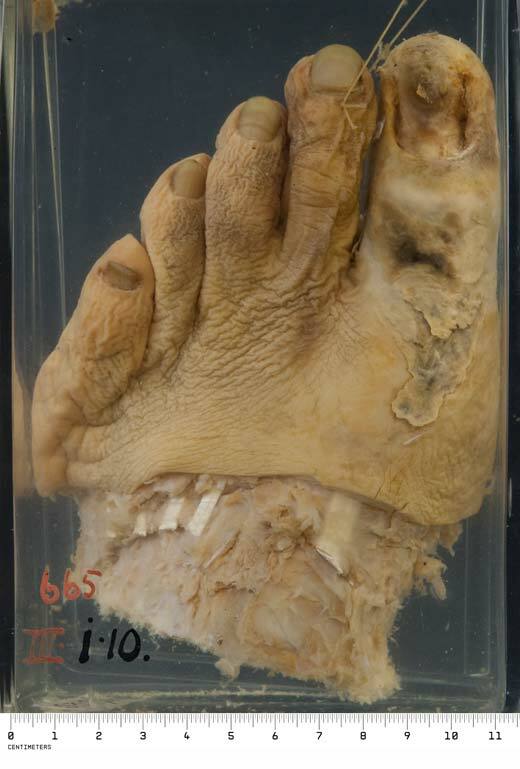 This is the gangrenous big toe of a man with thromboangiitis obliterans; secondary infection of the necrotic area had occurred, so that this is so-called "wet" gangrene. In 1950 Richard Doll and Austin Hill published their paper linking smoking to lung cancer in the British Medical Journal. (In 1955 Doll published a study firmly linking asbestos to lung cancer.) In the last few decades there has been a decline in lung cancer in men due to decreased smoking rates but in 1987 lung cancer overtook breast cancer as the leading cause of cancer death in women. Women appear to have a greater susceptibility to tobacco carcinogens than men; they are more likely to develop adenocarcinoma than squamous cell carcinoma so that adenocarcinoma is now the commonest form of lung cancer. There are four major forms of lung cancer; adenocarcinoma, squamous carcinoma, small cell carcinoma and large cell carcinoma. 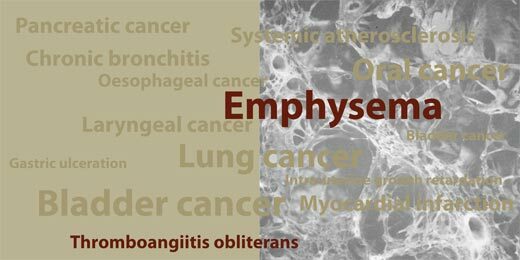 Squamous cell carcinoma is most strongly linked to smoking and sequential changes in the epithelium of the respiratory tract of habitual smokers can be observed: squamous metaplasia → squamous dysplasia → carcinoma in situ → invasive carcinoma. Classically, squamous cell carcinomas arise proximally in the lung from larger segmental or subsegmental bronchi while adenocarcinomas arise in the lung periphery. Squamous cell carcinomas may produce an intraparenchymal mass or fungate into a bronchial lumen; they typically become symptomatic when a major bronchus is obstructed, leading to atelectasis or infection. Local extension can be to the pleural surface and pleural cavity or into the pericardium. Further spread occurs to regional lymph nodes, and via lymphatic and haematogenous routes to major organs, to the adrenals in particular. Adenocarcinomas tend to be smaller with a bronchoalveolar pattern of spread; they metastasise early and widely. The patient was a 57 year old man, first admitted to hospital 5 months before his death complaining of swelling and stiffness of the joints. On examination there was marked clubbing of his fingers and swelling of his knees. The radiological appearances were those of hypertrophic pulmonary osteo-arthropathy, a common manifestation of lung cancer, but no lesion in his chest could be found on X-ray. The patient refused to stay in hospital and he was not seen again until three months before his death at which time he complained of cough and pain in the right upper part of the chest. There were then signs and radiological features suggestive of carcinoma in that region. 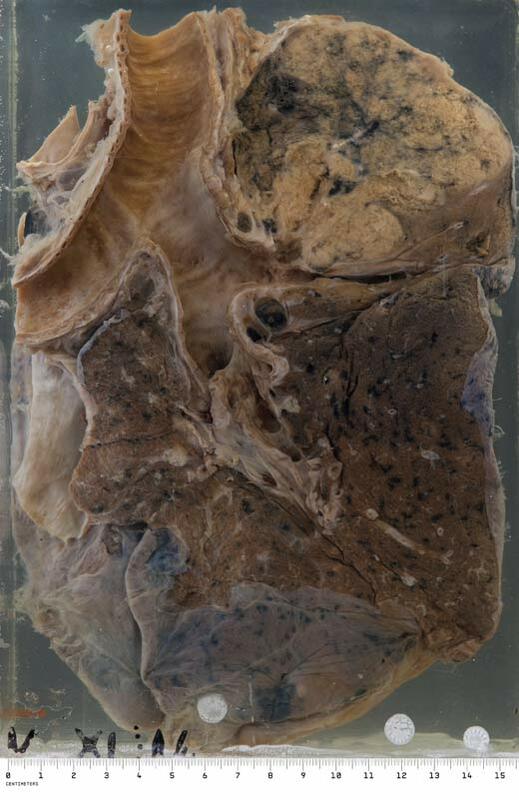 A massive neoplasm into which a large bronchus disappears, has replaced most of the right upper lobe and there are secondary deposits present in a mediastinal lymph node. The large carcinoma which has replaced most of the upper lobe of the right lung has its origin in the right upper lobe bronchus. The white excessively friable material occupying much of the neoplasm is keratin, identifying this as a squamous carcinoma. There is evidence of direct extension to the pleural surface and secondary deposits are present in the basal lobe; the basal lobe is also the site of a bronchopneumonia. 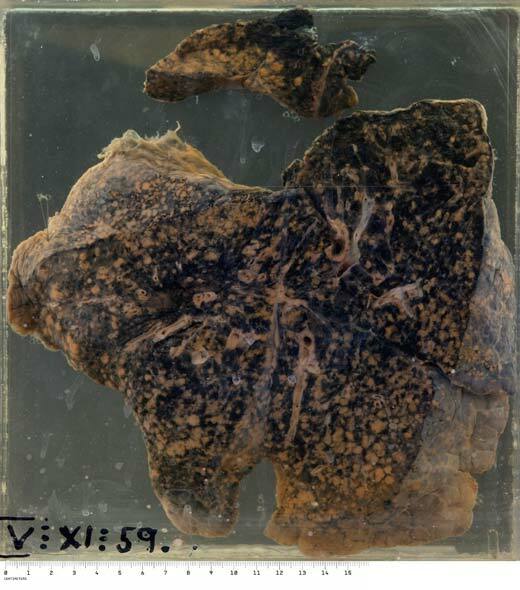 This specimen came from a middle-aged man who attended hospital complaining of a pain in the left hip, malaise and tiredness. Investigation showed diffuse opacities throughout both lungs, and lytic lesions in his bones. 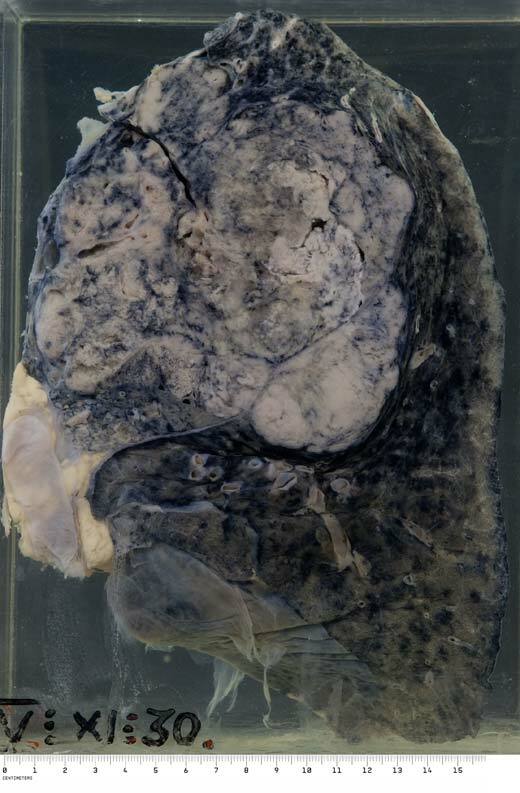 The lung shows diffuse carcinomatosis with tumour evident throughout the lung and spread over the pleural surface. There is no obvious primary lesion. Note also the deeply anthracotic appearance of the lung due to inhaled carbon pigment.